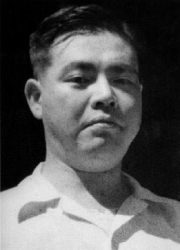 1939 : Became a member of Reiyuhkai through the lead of his aunt. the system and the teachings of Reiyuhkai, and guided the followers. teachings of the Lotus Sutra by Reiyuhkai . Happened to come across the writings of Sadao BEKKI, which gave him a chance to learn the relationship between Sadao BEKKI and Reiyuhkai. 1949 November 3: Given the revelation to found the Fumyokai Order. November 4: Seceded from the Reiyuhkai. November 16: Registered the foundation of the Fumyokai Order. November 23: Visited Sadao BEKKI. 1950 July 18: A feast was given in honor of the completion of the Main Hall. 1952 September 17: Celebrated the first ceremony. October 23 : Fumyokai Order was legally registered as a corporate religious body. 1956 August 4 : Given a revelation to go back to the celestial sphere. 1959 June 6 : Itinerated nationwide (third and final itinerancy till November 24 ). 1960 January 31: Died at Konjin Falls in Fukushima. ＊ Those information were uploaded to the Japanese Wikipedia.